Last week I posted about the cute DIY Mickey Mouse Invitations I made for my son’s 3rd Birthday Party. Today I want to share with you all the cute Mickey Mouse centerpieces I made for his party as well! These do require a little more time then the invitations but they are so worth it because I think they make a great addition to any Mickey party. I have listed the items you will need below. However, keep in mind you may need less or more depending on how many you want to make. I made 12 of these so I had a lot of supplies to get. I also recommend using coupons at Michaels or Hobby Lobby to save money on supplies. Spray Paint the Styrofoam balls. I found it easier to spray paint them on the sticks and it didn’t matter anyways because you want to spray paint the sticks black as well. Once the Styrofoam balls are dry you want to super glue them to each other. Obviously the smaller balls are for the ears so you hot glue one on each side. I found using toothpicks to mark where I want to glue worked really well. Make sure all the sticks are spray painted black and once those are dry, super glue those into the holes of the Styrofoam balls. This ensures nothing will fall off. Super glue the pipe cleaner to the top and wrap around the wooden stick. Then glue the very end down the the bottom. You don’t need to glue the entire pipe cleaner all the way around, just glue the ends and it will work just fine. Next I suggest super gluing the bottom of the floral foam blocks to the bottom of the baskets or buckets. This helps keeping everything centered since the mickey head is top heavy. Once that is glued in you can stick with the mickey head in. That’s it! 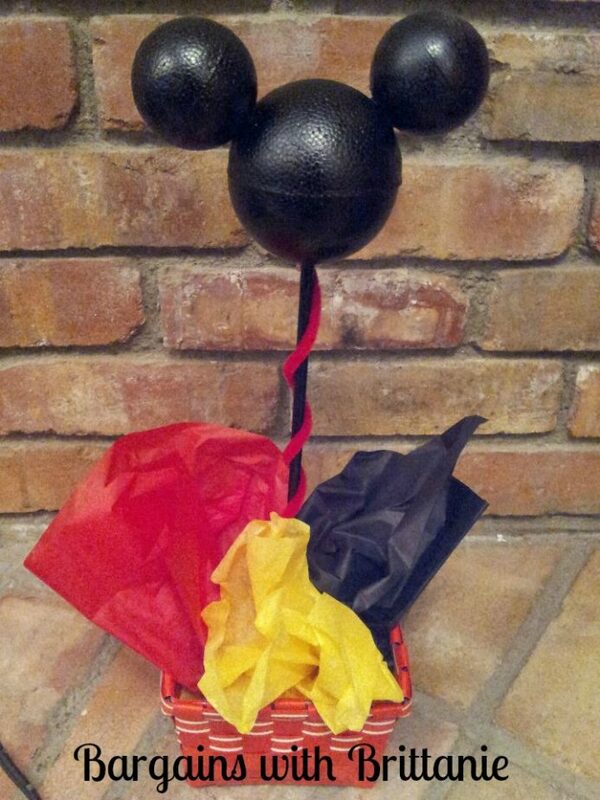 You have your very own Mickey Centerpieces and they only cost about $20 in all to make. Like I mentioned, I was able to make about 12 of them so you could cut that cost if you are making less. Do you like this DIY party decoration idea? If so Repin it using the button below!